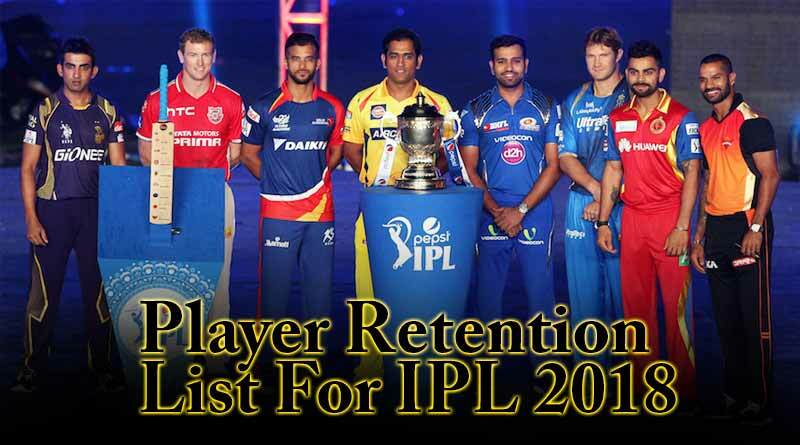 With the auction of players closing in, everyone wants to know about the player retention list for IPL. With the auctions for this year’s IPL only a fortnight away, teams submitted the names of the players retained by them. According to this year’s rules, the participating teams had an option of retaining a maximum of three players before the auction takes place from 28-29th of this month. Captain Virat Kohli became the highest paid player in the history of IPL as Royal Challengers Bangalore retained home for 17 crores. The figure is hardly surprising considering the fact that Kohli is of upmost importance to the Bangalore side both for his leadership skills and immense batting talent. Gautam Gambhir and Chris Gayle were the biggest surprises as both were not retained by their respective franchises. With all teams retaining at least a minimum of two players, Punjab stood out from the lot as they retained only one player in Axar Patel. The franchises that have gone for full three retentions are CSK, Mumbai Indians, Delhi Daredevils and RCB. All three teams retained players crucial for their success and which will help keep the backbone of the team intact. The full list of to-be-auctioned players will be released by the BCCI on January 18. The BCCI has also introduced two right to match cards for each team which will further allow each team to retain two more players of their choice if they match the highest bid submitted for that player. Being the first time that this card has been introduced it will be interesting to see how the teams go about using it. Sunrisers Hyderabad: David Warner, Bhuvneshwar Kumar Purse Remaining: Rs 67.5 crore.